VietNamNet Bridge – The Vietnamese retail market is so attractive that real estate developers and bankers have also decided to join the market. The market, in the eyes of retailers, has always been very lucrative with the stable annual two digit growth rate. The latest report of Kantar Worldpanel showed that the consumer goods sale in Vietnam was the highest among the 11 Asian countries. 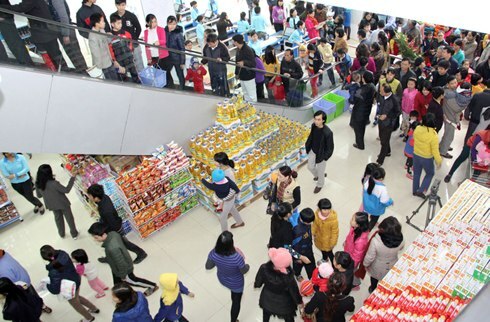 The owner of a domestic retail chain has noted that though the purchasing power has weakened due to the economic crisis, Vietnam, a young market with the high population remains very potential. The General Director of a real estate consultancy firm said a client of his has been quietly surveying the eastern and southern parts of HCM City, preparing for its plan to open a supermarket chain, slated for two or three years. Analysts have also noted that the majority of the groups of 30 Japanese businessmen to Vietnam some days ago were the owners of the retail chains. The Vietnamese retail market is so attractive that it has attracted the investors from other business fields as well. Ocean Group, a real estate and banking group, has revealed the plan to open 70-80 supermarkets and shopping malls nationwide by 2015, a part of the plan to jump into the retail industry and turn retailing the strategic move of the group. The big guy in the real estate sector has taken initial steps in its plan by putting two supermarkets into operation – Ocean Mart Ha Dong and Ocean Mart Thang Long. Nguyen Manh Duy, Managing Director of Ocean Retail, said possessing business premises brings Ocean Group a big advantage when joining the retail market. Besides, he said, the current gloomy real estate market brings the opportunity to join the market at a low cost. Meanwhile, Son Ha Group, a stainless steel household appliance manufacturer, has also jumped on the bandwagon by opening its first hypermarket – Hiway – in Ha Dong district in Hanoi, the move which shows its plan to jump into a new business field. Commenting about the appearance of the new players in the playing field, Chair of the Hanoi Supermarkets’ Association–Vu Vinh Phu, said this shows the attractiveness of the retail market. Modern supermarkets would step by step replace the traditional markets which have been existing for the last many years. CBRE, a real estate consultancy firm, has noted that the Ministry of Industry and Trade’s plan to develop the network of supermarkets and shopping malls has given a push to the investors. Under the plan, by 2020, Vietanm would have 1,200-1,300 supermarkets and 180 shopping malls. It is expected that the retail via supermarket and shopping mall network would account for 45 percent of the total retail turnover in the society. However, the investors have been warned that they would meet big barriers when joining the market. President of Son Ha Group Le Vinh Son has informed the opening of the second supermarket may be delayed. Prior to that, when opening the first supermarket, Son affirmed that two more Hiway supermarkets would be opened in 2012. Local newspapers have reported that a big guy in the retail industry, the Japanese Family Mart, has just sold out its entire stakes in the joint venture with the Vietnamese Phu Thai Group after it took loss in the Vietnamese market.